Bayshore Therapy & Rehab assists you to achieve maximum function and independence. We provide a wide range of physiotherapy, occupational therapy, speech-language pathology, rehabilitation services as well as occupational health and wellness services. Our process starts with an assessment of your needs and together, we develop a plan that will help you achieve your goals. Our rehabilitation teams work with you, your family, referral sources and other professionals involved with the long term planning of your recovery. Through our residential (in-patient) program, run by the Neurological Rehabilitation Institute of Ontario (NRIO), we offer services for individuals who have sustained a catastrophic brain injury and require 24 hour care supported by a multi-disciplinary and intensive rehabilitation program. All of our programs are designed to help people recover, rehabilitate and overcome injuries, illnesses and disabilities. These services are delivered in the home, workplace, community, school or residential settings and are chosen by the public, lawyers, case managers, regulated health care professionals, employers, insurers, and the government. Physiotherapy focuses on evaluating, restoring and maintaining optimal physical function using a range of treatment techniques. Our physiotherapists have a detailed understanding of how the body works, and apply their specialized education and clinical skills to assess and improve clients’ movement and function, and help identify and relieve their underlying causes of pain. Prescribed exercise programs – improves joint range of motion, muscle strength, posture, balance, functional abilities and pain management. Fall prevention – focuses on the causes of falls and prevention. Gait aid prescription and training – determines the most effective assistive devices to improve your safety and enhance your mobility i.e. walkers, canes to give you maximum function and independence. Assistive devices program (ADP) – Our ADP mobility aid Authorizers assist clients in determining their eligibility for government-funded programs and prescribe mobility aids suitable to their needs. During your first visit, your physiotherapist will conduct a comprehensive assessment of your health history, pain, movement, strength, balance, sensory system and cardiorespiratory status. The information gathered in the assessment will be used to determine a diagnosis and provide insight into your specific situation. From there, your physiotherapist will work in partnership with you to establish a personalized treatment plan, consulting with other members of our health care team if necessary. When your treatment program is complete your physiotherapist will teach you how to continue or maintain your progress independently, and advise you of relevant community programs. Led by Director, David Rosen, he and his team provide a wide range of physiotherapy, occupational therapy, exercise therapy, as well as occupational health and wellness services. Walk-ins are welcome. If you are unable to participate in your normal daily activities due to an illness, disability, injury or the aging process, an occupational therapist can help. Our occupational therapists are skilled, regulated health professionals who work directly with you and your family, employer and/or other professionals to help you learn or re-learn everyday activities, and increase your mobility, independence and active participation in life. Assess your physical, cognitive, psycho-emotional and functional status and develop comprehensive treatment programs to achieve your personal goals. Assess your home, workplace and other environments to address safety issues and recommend modifications. Assess workplace ergonomics, recommend modifications and design return-to-work and disability management programs. Prescribe assistive devices and technologies that allow you to function well at home, work, school, and in the community. Provide education including: task modification, pacing, pain management, energy conservation, body mechanics, posture and cognitive compensatory approaches. Work with seniors to maximize safety and independence with daily activities. Work with children to develop fine, gross motor and visual motor co-ordination skills. Determine eligibility for funding support from federal and provincial programs, as well as extended health care, auto and workplace safety insurance. Occupational therapists help maximize functional independence for individuals with a wide range of limitations, so every client will receive a unique therapy program. Generally speaking, during your first appointment you’ll take part in a thorough assessment of your functional abilities and limitations. You may also undergo a physical, cognitive or psycho-emotional evaluation and we may arrange an assessment of your home, workplace or other environment. From here the occupational therapist will work in partnership with you to identify goals and develop a personalized therapy plan, communicating with other health care professionals on your team. The therapist will recommend assistive devices and technologies, if appropriate, teach you how to use them, provide education and monitor your progress. Your occupational therapist will also refer you to other helpful community resources. We offer in home speech and language therapy to home bound clients in regions across Canada. These services include swallowing assessments and treatment, and communication therapy following stroke, head injury, and other neurological conditions. For our patients who have experienced a motor vehicle accident, our Speech Language Pathologists work with a team of medical, legal and rehabilitation professionals to assess and treat the communication disorders that arise following trauma. Our speech-language pathologists are skilled regulated health care professionals with the knowledge and clinical training to assess and treat swallowing and communication challenges. We work with pre-school and school-age children, as well as adults, who are experiencing difficulties speaking, swallowing, listening, reading or writing. A speech and language clinic is located in Windsor- Essex County that provides a wide range of speech therapy services to children and adults. Speech and language disorders to improve speech disorders including apraxia, dysfluency. Language disorders including difficulty listening, understanding, reading and writing. Cognitive communication disorders following head injury that focuses on improving reasoning, problem-solving, memory and organizational skills. Myofunctional therapy to assess and treat tongue thrust, tongue tie and other orofacial difficulties, including a habit elimination program (thumb sucking and other oral habits). Lee Silverman Voice Therapy (LSVT) for patients with Parkinson’s disease is also available. Home Safety and Accessibility: Assess the home and make recommendations to ensure the client is able to get in/out of the home and is safe within the home. This can include coordinating equipment and other adaptive aids to allow the client to be safe and maximally independent. Discharge planning/discharge from hospital to home: Assist clients from hospital to home by assessing the home environment, coordinating equipment and services and communicating with the hospital team to ensure recommendations are implemented before and after client is discharged. 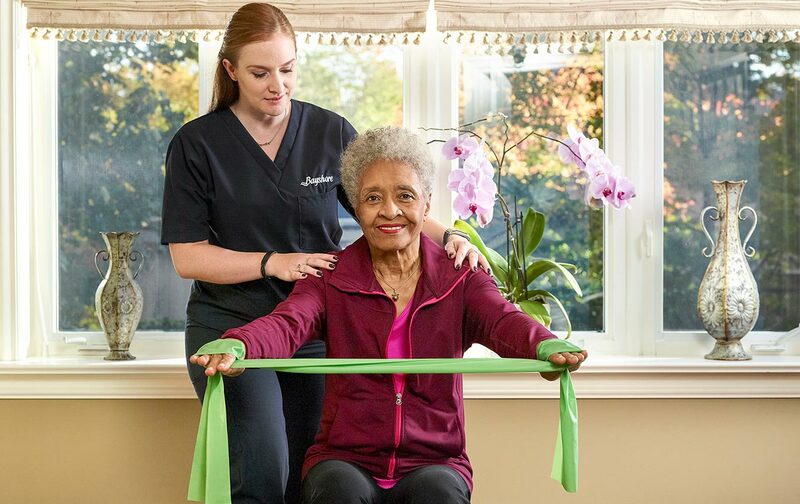 Mobility and transfer issues: Assess and teach the client and caregivers the best way to move and transfer allowing the client to be independent and safe as well as to prevent client or caregiver injuries. This may include recommending equipment and other aids to help the client to be independent, with or without support in their home environment. Fall prevention techniques: Assess the home and the client to identify risks that may cause a fall and to make recommendations to prevent falls. This may include recommending equipment, home modifications and an exercise program to increase or maintain strength, mobility and balance. Pain Management: Assess client and work with other health care providers to make recommendations on exercise, positioning, equipment and other strategies to manage pain. Wheelchair/walker equipment needs: Assess the client and make recommendations for wheelchairs, walkers, other mobility aids etc. to support comfort, safety and maximum function. We will also assist client with accessing funding sources. Swallowing or speech concerns: Assess and treat for swallowing and communication challenges. Community / Life Skills Worker: Provides supportive care services to clients and assists clients with activities as directed by the rehabilitation provider. Memory and cognition issues: Individualized treatment and compensatory strategies to help a person achieve and maintain their maximum function. Return to work/school programs: We provide early intervention to support a safe, progressive and sustained return to work/school program engaging everyone involved. If you are new to home care or need additional services, let us help you find the care you need. Our care planner also provides helpful information and resources to support you through your care journey. To get started, please tell us a bit about yourself.